eD@HoMe: A lovely FDC from Malaysia! 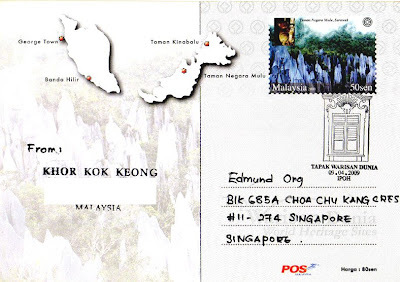 Here is one awesome FDC from Malaysia, courtesy of Khor! Thank you very much! 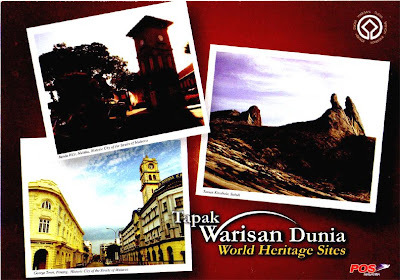 This beautiful cover features 4 stamps from the "World Heritage Sites" series, issued on 9th April 2009. 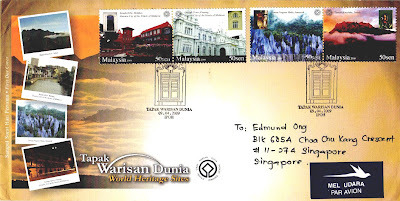 The first 2 stamps from the left of the cover depict Benda Hilir in Malacca and George town in Penang. Malacca and George Town were declared UNESCO World Heritage sites on 7th July 2008. The influences of Asia and Europe have endowed the towns with a specific multicultural heritage that is both tangible and intangible. With its government buildings, churches, squares and fortifications, Malacca demonstrates the early stages of this history originating in the 15th-century Malay sultanate and the Portuguese and Dutch periods beginning in the early 16th century. Featuring residential and commercial buildings, George Town represents the British era from the end of the 18th century. The two towns constitute a unique architectural and cultural townscape without parallel anywhere in East and Southeast Asia. 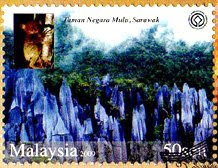 Next, is a stamp featuring the beautiful Mulu National Park (Taman Negara Mulu) in Sarawak. The Park is named after Mount Mulu which is the second highest mountain in Sarawak. It received inscription as a UNESCO World Heritage Site in 2000 for its outstanding universal values of natural environment settings by surpassing four main criteria. Its combination of alluvial clays, impressive canyons, spectacular sandstones and limestones formations, untamed rivers, serene rain forest rich in astonishing numbers of plants and animals species, imposing mountains, rank among the world's most outstanding scenery and further add to the variety and specialization of the park's biology. 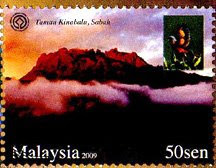 The last stamp depicts Kinabalu Park (Taman Kinabalu). It is named after Mount Kinabalu, the highest mountain on the Borneo Island. It received inscription as a UNESCO World Heritage Site in 2000, which confirms its exceptional universal values of a natural site and the role as one of the most important biological sites in the world. This park is blessed with an astonishing variety of flora and fauna that ranges over 4 climate zones, The mountain is famous for its many carnivorous plants, mammals, orchids species and birds including the beautiful Scarlet Minivet features at the top of the stamp. In addition, Khor also sent me a lovely postcard from this series. On the card is a pre-printed stamp showing the beautiful Mulu National Park. Thanks again! !